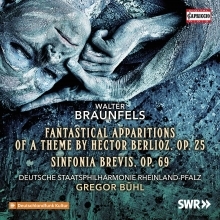 Walter Braunfels is a composer whose music died twice: Once when the Nazis declared his music “degenerate art”. Then again when post-war Germany had little use for the various schools of tonal music; when the arbiters of taste considered any form of romantic music – almost the whole pre-war aesthetic – to be tainted. 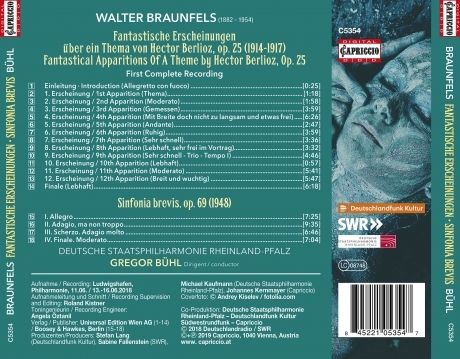 This 7threlease of Capriccio’s Braunfels Edition shows again his large range of colorful music and focus this time on his early great Orchestral work Fantastical Apparitions Of a Theme by Hector Berlioz, Op. 25 (1914-1917) – the first complete recording of this amazing composition, compiled with his last orchestral work, the Sinfonia brevis op. 69(1948).